Easily operate your washing machine Electronic controls make it easy to adjust settings. Large 4.5 cu. ft. capacity Do more laundry in less time. This size is a good choice for growing families and for washing bulky items like comforters. 24 automatic cycles give you more control Lets you select the best cycle and options for your load. Include pre-wash, delicate, cold wash, BrightWhite, allergiene, and more. Helps detergents dissolve properly Activate steam during the wash cycle for a thorough clean. Sanitary Gets dirty sports uniforms and work shirts clean and bright. VRT (Vibration Reduction Technology) Minimizes noise and vibration for flexible placement. LoDecibel quiet operation sound package Keeps operational noise to a minimum, so you can complete laundry without disrupting your household. 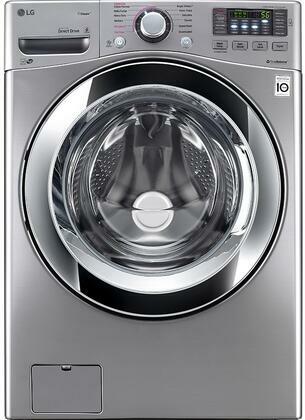 Front-load design For thorough washing without agitation. Stainless steel drum Provides strength and durability. ChildLock Helps prevent accidental or unsupervised operation.